Martha Kumsa, a journalist for the Oromo language publication Bariss, published in Addis Ababa, Ethiopia. After her arrest in 1980, along with other prominent ethnic Oromos she was held in an Ethiopian jail without a trial. The arrests, following an armed attack by the Oromo Liberation Front, were an effort to deter Oromos from supporting the OLF. Martha Kumsa was adopted as a prisoner of conscience by the Laredo, Texas Amnesty International USA group 306. Eric Avery was a co founder of this AI group. 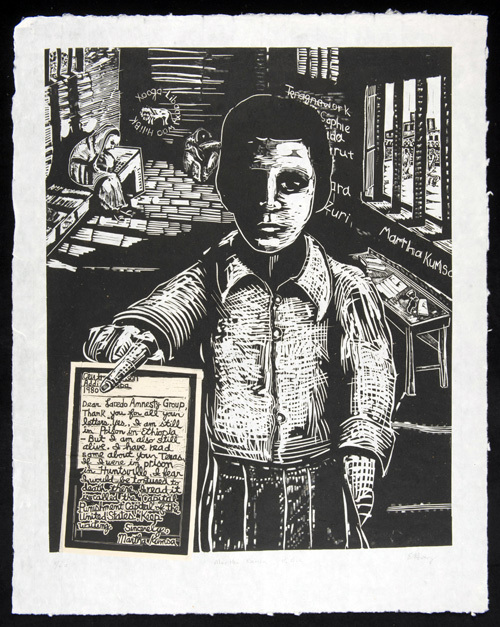 The print, made for the 1986 Houston exhibition Prisoners of Conscience, was a collaboration between the Houston Chapter of Amnesty International (Group 23) and Diverse Works. Works from this exhibit were shown again in September 2013 at Diverse Works in The Eleventh Hour.